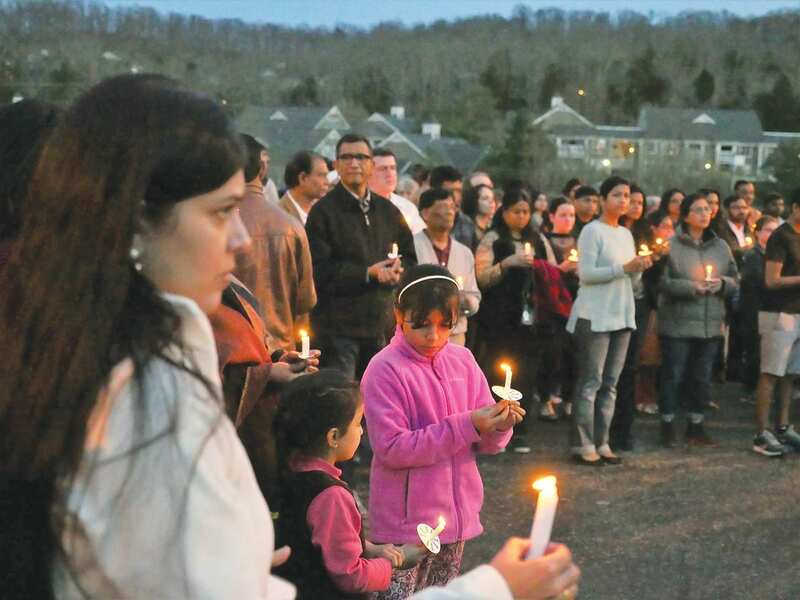 BELLEVUE, TN — Nearly 150 people gathered at dusk recently at Sri Ganesh Temple for a candlelight vigil for Srinivas Kuchibhotla, the engineer from India, who died from a gunshot by a Kansas man who was later charged with the killing. Representatives from the India Association of Nashville and partner organizations spoke briefly to a crowd assembled to pay homage to the slain engineer Kuchibohotla and his family. A bouquet of flowers was centered before a large portrait of Kuchibhotla on a hill so people might see and hear remarks from leaders of the congregation and listen to a performance of “This Land is Your Land” by a young singer and guitarist Sankalp Salil Shibad, whose family are U.S. citizens and live in Brentwood. His grandmother, Shaila Shibad suggested he sing the song. “It is hard to digest. We are all here as brown skinned citizens of this country. We need to recognize this hate crime and work very hard to control our emotions and conduct ourselves peacefully and be model citizens. I give all these engineers credit for helping our community to prosper. We must not promote hatred. We must not promote a gun culture. We must promote peace and do what Ghandhi-ji would do and walk in peace,” said Dr. Vedyas Biliyar, former chair of the Ganesh Temple Board of Trustees. “We pray for his soul to find peace,” said Dr. Pankaj Srivastava, chair of the temple’s board. While most of the crowd are members of the temple community, Stephanie Teatro from the Tennessee Refugee Rights Coalition expressed support for the community. “We stand with you all, and all Nashvillians, who are fearful for their families and community,” Teatro said. “It is a dark time … but we know there is a lot of support from the city council to make Nashville a welcoming place,” said Teatro. Organizers read a long list of organizations supporting the vigil: the Mayor’s Office of New Americans, Mayor’s New Americans Advisory Council, Tennessee Business Association, Tennessee Immigrant and Refugee Rights Association, and Global Education Center. Also supporting the vigil: Bengali Association of Greater Nashville, BAPS Swaminarayan Temple, Gujarti Cultural Association, Gurudwara (Southeastern Sikh Religious Society), Friends of India Association of Murfreesboro, Indian Community Senior Support Services, Kala Nivedanam, Nashville Kannada Koota, Kerala Association of Nashville, Marathi Mandal: Anirudda Sathe and team, Nashville Nepalese Association, Sri Sai Baba Temple, Tennessee Tamil Sangam, Tennessee Telugu Samiti, 42 Samaj of Tennessee, Umiya Dham of Tennessee. A recorded eulogy from president of India Association of Nashville (IAN), Srivatsan Pallavaram, (who was in India at the time) was played for the crowd. The remarks were followed by one minute of silence as the audience held candles.